The above excerpts are from the English translation of first block the 3rd edition contact notes, Plejadisch-plejarische Kontakberichte Block 1, published in 2002. In the Semjase Blocks 1st edition there is no distance between the Great Spacer and the Horsehead Nebula mentioned at all. In the Semjase Blocks 2nd edition, the distance was given as 2 million ly, which was obviously a typo since this would be a location outside the Milky Way galaxy (the Milky Way diameter is 100,000-120,000 ly; the distance from Earth to the Andromeda galaxy is 2.5 million ly). This error was initially also printed in the 3rd edition contact notes, but this was corrected to 200 ly in a corrigendum. 117. We are at the next aim, 1810 light years in distance from the earth. 118. You call this strange appearing for you picture there far away the Horsehead-fog. 123. You call the strange looking formation there, far out in space and 2 million light years away, the Horsehead Nebula. 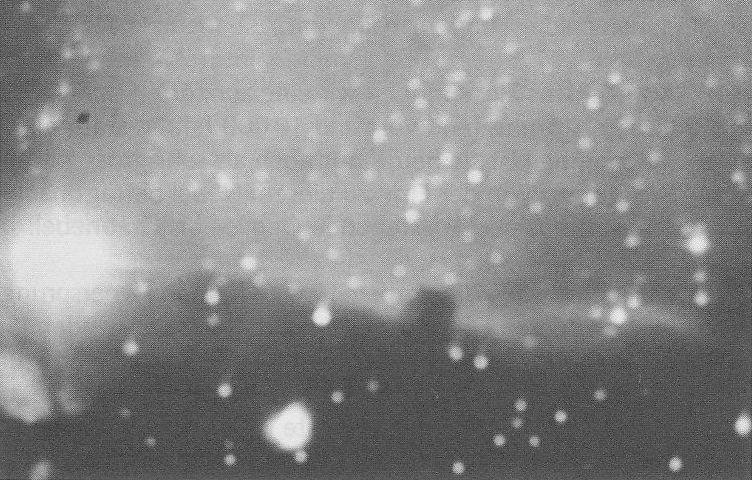 In this letter, K. Locher suggest that if the photograph was really taken by Meier from a relatively short distance away (200 ly?) from the Horsehead Nebula, as was mentioned in the caption of the photograph, then the picture should be very different. The foreground stars should not be visible at all in the photograph since these stars should be either to the side or behind the photographing position (Great Spacer). Locher’s letter was answered by Meier with a 4 page ‘open letter’ to Locher in the same issue. In his response, Meier seemed quite upset that Locher implicitly accused him of forgery, as in his long and fiery reply he accuses Locher of not being objective, scientific and calls him a disgrace for the Swiss Astronomical Society. However in these 4 pages, Meier doesn’t at all respond to the specific criticism on the pictures of the Horsehead Nebula and the Pleiades star cluster, which he allegedly photographed during his space journey. The same reasons which were highlighted by the Swiss physicist Locher above, were also being pointed out by the Swiss Meier case investigators to the MUFON, who then published it in their – The MUFON UFO Journal No. 150 (1980) under the title of the article, ‘New View of Pleiades’ by Richard Hall. 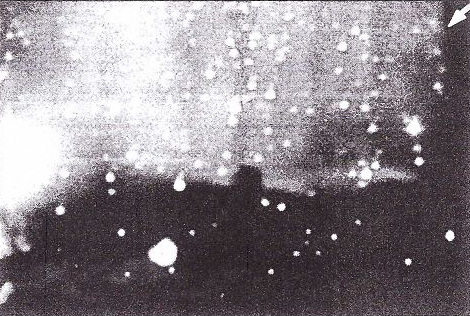 As for point 1, this would be true if Meier would have made the pictures through a glass-type window, but Korff ignored the fact that Meier claims to have taken at least some of his outer space pictures from a special apparatus that the Plejaren constructed for him. 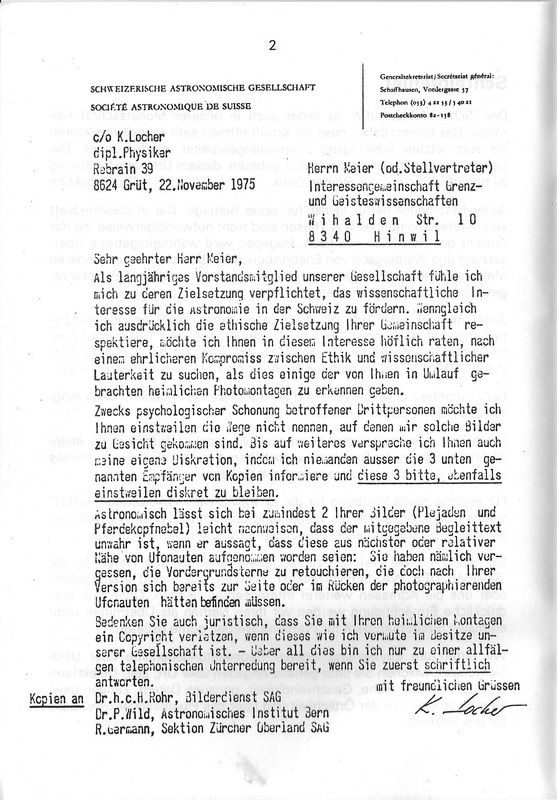 Regarding point 2, for his “a few thousand kilometers” source, Korff cited an anonymous person who was an associate of Hans Jacob with whom Korff corresponded on May 24 and June 23, 1980. However, the contact report states that Meier and the Plejaren are at a position 1,810 light years from Earth and 200 light years from the Horsehead Nebula, not a few thousand kilometers away. Regarding point 4, note that the picture in PPKB 1 is cropped on all sides except the left side, when compared with the picture in Korff’s book. It is interesting to note that the image in Korff’s book is apparently cropped on the left side, when compared with the picture in PPKB 1. Perhaps Korff got a different version of the same picture from Hans Jacob. What is even more interesting is that in the new picture published in PPKB 1, the curvature that resembles the curvature of a TV or other device’ screen as shown in Korff’s picture, has been cropped. Regarding this issue, Wendelle Stevens seems to have suggested that these curved edges were cropped (reasons not mentioned) at Meier’s end to make them disappear from the image. See the 3-part investigation on Apollo-Soyuz et al. pictures for more information on this ‘curved-edges’ topic (search for the word ‘curve’). Obviously, the viewing direction, which would have been roughly in the direction of the blue arrow, and the close distance to the Nebula would result in a completely different picture with different (background) stars, nebulae, etc. compared to a picture taken from Earth towards the Horsehead Nebula. Is Meier’s picture indeed completely different compared to pictures of the Horsehead Nebula taken from Earth? Below is a comparison between Meier’s picture and a picture of the Horsehead Nebula taken through a telescope (March 21, 2005, Ryan Steinberg and Family/Adam Block/NOAO/AURA/NSF). Also see this animation for a better comparison. As can be seen, all the stars and nebulae are practically at the same position in both pictures. The big bright star on the left is Alnitak, the distance of which is mostly given as about 800 ly, although the Wikipedia page gives a distance of almost 1,300 ly. Either way, the distance between the Horse Head Nebula and Alnitak is more then 200 ly, so it should not appear on Meier’s photograph as already mentioned by K. Locher. Clearly, both pictures are taken from the same location in the Milky Way galaxy: Earth. Wendelle didn’t cite the source of the above information which states that Meier was forced to resort to collecting earth-based observatory pictures to illustrate to people what he saw and photographed during his space journey. Nor were we able to find any such information published by Meier/FIGU. Also Wendelle didn’t point out what space pictures he was referring to. Let us for a moment assume Wendelle’s information is true and also applies to the Horsehead Nebula picture of Meier’. Since the Horsehead Nebula has been recorded since the year 1888, there were already abundant sources in 1975 from which the Meier picture could have been taken. Could it be that this picture is one of those stellar Earth-based observatory pictures that were used to illustrate Meier’s journey, and eventually were confused by 0thers as actual pictures from his trip? 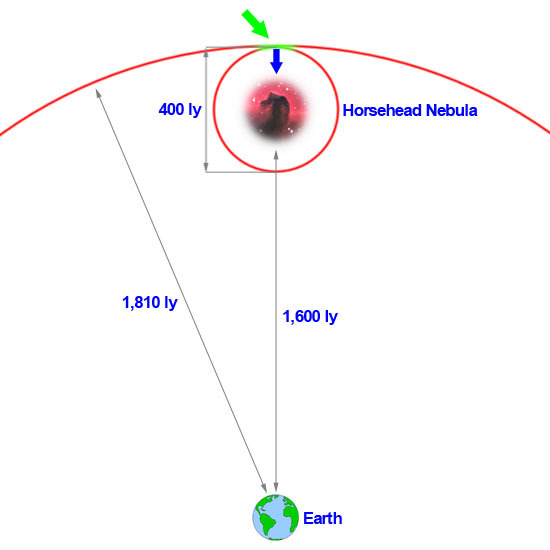 All of the above reasons indicate that the Horsehead Nebula picture is considered as a genuine picture photographed by Meier during his space journey and not an Earth-based observatory picture. Even though Meier/FIGU were aware of this article, in their August 1996 rebuttal (by Michael Hesemann) we find no mention of the Horsehead Nebula picture and other similarly dubious evidence that has been adressed by Bürgin or Korff. We investigated a picture of the Horsehead Nebula which Meier allegedly photographed during his Great Journey, of which it is suggested that it is part of a collection of 42 space pictures that were verified and authenticated by the Plejaren Ptaah as either genuine or only slightly falsified. When compared to a picture of the Horsehead Nebula taken from Earth, the stars and nebulas and their relative positions are practically identical, which means Meier’s picture is definitely not taken from a position 1,810 ly from Earth and 200 ly from the Horsehead Nebula, as Contact Report 31 implies, but from Earth.